After the tremendous success of the Xenoverse series, the Dragon Ball universe makes its debut in the 2D fighting game world. 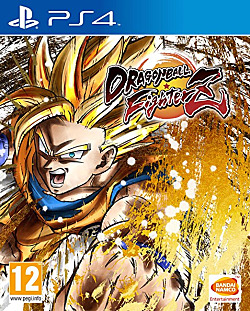 From Goku and Vegeta to Cell and Black Goku, play as numerous iconic heroes and villains, new and old, in this 3-on-3 team battle in classic Dragon Ball style fights of epic scale in beautifully crafted graphics. Boasting easy to learn but difficult to master gameplay, Dragon Ball FighterZ offers accessibility to new players and the level of depth veteran fighting game players yearn for. Bandai Namco shares a new trailer, which confirms several characters that will be coming to Dragon Ball FighterZ's roster in the game's second season. Who should come to Dragon Ball FighterZ this year? See who we feel should make the cut. A new Dragon Ball Z action RPG is in the works. Here's what we know. Black Friday is almost here, and that means leaked advertisements abound! We've rounded up some of the biggest upcoming Black Friday 2018 deals just for you. From mechs and Fire Emblem to Mario Party and Fortnite, today's Nintendo Direct had a lot to show off. Dragon Ball FighterZ features a series of square colors next to your name indicating a rank, but with no explanation of what color means what! A quick guide on how to summon Shenron in Dragon Ball FighterZ. It could help you turn a match! Looking for the best early mods to change the look and feel of Dragon Ball FighterZ? Check out my top five in this list. Unlock all special event combinations with the help of this guide to Dragon Ball FighterZ. Dragon Ball FighterZ has a lot of fighters, but it could use a few more, right? Here are five DBFZ characters we'd like to see as DLC. Can't play any Dragon Ball FighterZ matches with your friends? Launch has been plagued by connection errors, but there are workarounds. An all-new character introduced with Dragon Ball FighterZ, Android 21 is a dastardly scientist filling the world with clones ... and turning enemies into cupcakes! Slick combat, plenty of modes, and the best visual representation of the franchise in a video game yet make Dragon Ball FighterZ a game you definitely want to play! More than 20 combatants make Dragon Ball FighterZ's character list. Here are the fan favorites and newcomers that make up the roster. Which of the two fighting games will be more popular: Dragon Ball FighterZ or Dissidia Final Fantasy NT? Here are a few strong arguments in favor of DBFZ. Bandai Namco Entertainment has revealed more details on new content and a collaboration between Dragon Ball Xenoverse 2 and Dragon Ball FighterZ. Marvel vs Capcom: Infinite is here. It's the weakest entry in the series and no one likes it...but why? Not all Dragon Ball Z games are created equal. Newest Dragon Ball Fighter Z details and characters. With a deeper combat system, unique characters, and smooth animations, the upcoming FighterZ may be the best DBZ fighter yet.